It is important to consider energy efficiency when the time comes to replace your conventional water heater. Plummer Enterprises offers energy-saving, state-of-the-art tank-less hot water heaters to Northwest Ohio. The tank-less water heater solutions that we install provide endless hot water supply and significantly reduce your monthly energy costs. 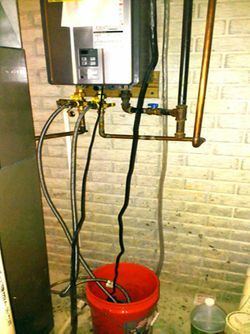 The heating device in a tank-less water heater is activated by the flow of water when a hot water valve is opened. Once activated, the hot water supply is endless. Since the water does not start heating until you turn it on, to prevent delayed heating and conserve water, many people install a specialized pumping system that does the trick.